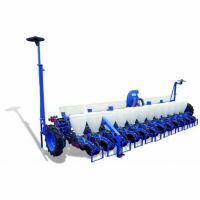 are used for sowing seed dashed maize, sunflower and other cultivated crops with simultaneous fertilizer separately from the seed. Used to work in all climatic zones except in the mountain areas zemlevozdelyvaniya. Teamed with their class 1.4 t tractors, such as overcurrent and UMZ. It can be equipped with a system of control of the process and the level of sharps seeds seed and fertilizer in the hopper. Manufactured 8- and 6-sectioned. Width in this case is 5.6 and 4.2 meters. The benefits include items such as ease of handling, ease of setup and ease of control of the sowing process. With the help of the mechanism of transmission of the supporting-driving wheels is carried out semyavysevayuschih rotating discs and the screws spring fertilizer distributing apparatus. The vacuum in the cavity horseshoe sowing apparatus cover is formed by a fan which is driven by a hydraulic motor of the tractor, or by dilution of a special exhaust pipe. In order to control the values ​​of vacuum to the fan or the exhaust put control valves with diaphragm gauges, which indicate the pressure.